1. Preheat oven to 350 degrees. Grease a 9-inch Bundt pan with melted butter and set aside. 2. Combine all cake ingredients, except the white chocolate chips, and mix for approximately one minute with an electric mixer until smooth. Mix in the chocolate chips. Pour the batter into your greased Bundt pan. 3. Bake for 50-55 minutes, until a toothpick comes out clean. Allow the cake to cool in the pan for 10 minutes and then carefully flip your pan onto a cake plate. 4. To make the icing, whisk together the powdered sugar, milk and vanilla. Drizzle icing onto cake with a spoon. Grate lemon zest on top of icing and garnish with white chocolate chips. This past Christmas Eve my family hosted a dinner party. While all of the food was delicious, there was one thing that really “took the cake”! 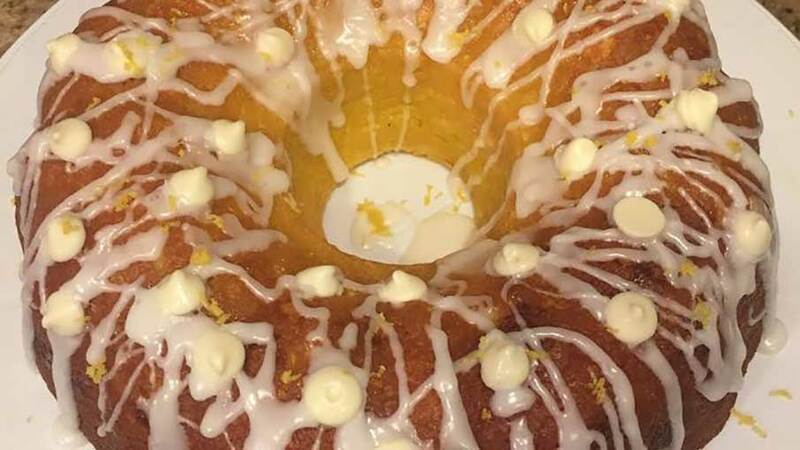 Keri, a dessert wizard and founder of Keri Treats brought a gooey, moist, dense, vanilla Bundt cake. I instantly asked for the recipe, bought a Bundt pan and made it six days later to bring to a New Year’s Eve party. To my surprise my Bundt cake turned out just as delicious as Keri’s! I transformed my dessert-hating friends into dessert lovers. People were asking me to bake it for their birthday. It was a hit. One month later it was my co-worker’s birthday, and I had an excuse to make it again. This time, I experimented by swapping the vanilla cake mix for a lemon mix and added some lemon zest. I’m not sure which version I prefer, but I will say that you can get away with eating the lemon version for breakfast.